Gadgets from Apple are always loved by all of us, and if these exotic devices are within our reach, we would have had all the devices at our home. iPhone is one of the best and the most loved smartphone in all over the world. This exotic device suffers from only one single drawback, that is: its internal memory is limited, causing too many memory problems. To help you from all the memory frustration, we have listed 5 best iPhone cleaners iOS which can easily help your in clearing out unwanted files so as to free up memory space. In search for something to help you free up iPhone space, you might have passed by hundreds of apps, but all of them turned out to be useless. 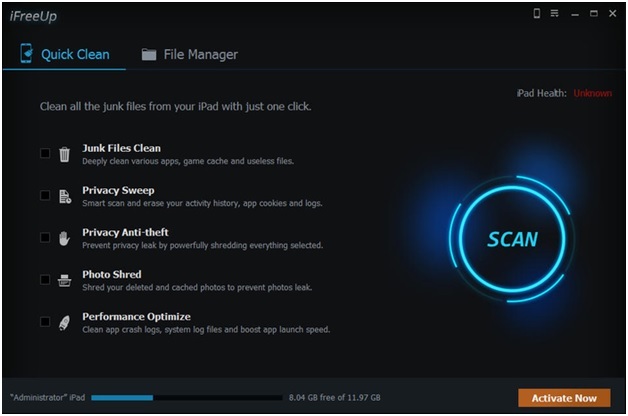 Well here are the 5 best iOS memory cleaners that will help you to get free space quickly. With 25+ advanced space saving analysis technologies, this iPhone cleaner thoroughly scans your iPhone and analyze how much used space can be cleaned. It offers you 1-click to remove all useless files at once. 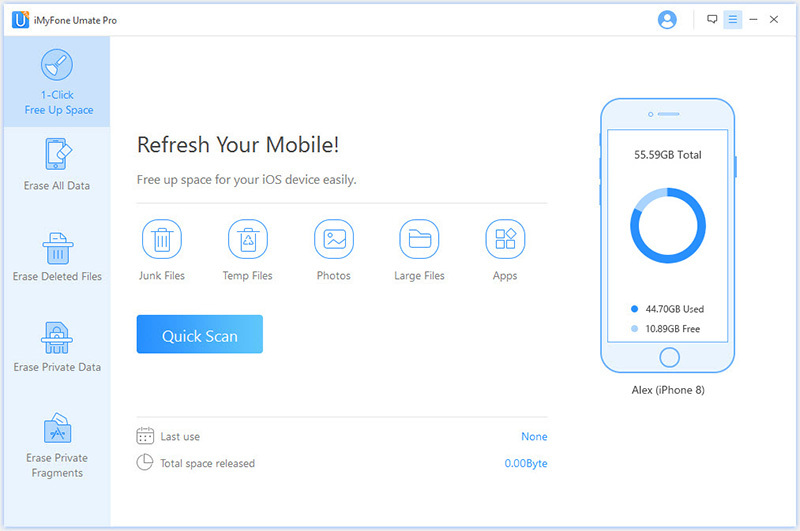 Thoroughly clear 30+ junk and temporary files which slow down your device - Free Trial. 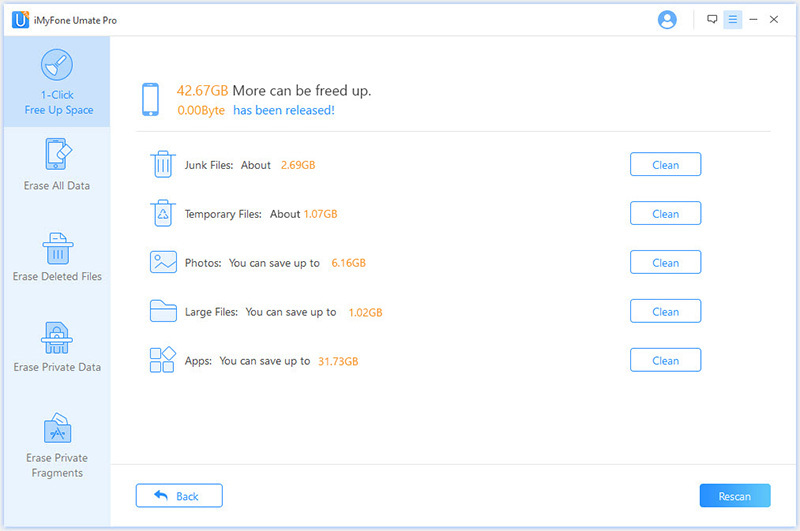 Losslessly compress iPhone photos to save 75% photo space. Back up photos & large files to computer and delete them from iPhone. Also clean iPhone messages, contacts, note, WhatsApp/WeChat data, cache, browsing history, etc. Permanently delete iPhone data, 100% unrecoverable. Erase incomplete third-party apps fragments to save space and boost iPhone. This iPhone memory cleaner is fully compatible with iOS 12 and receive lots of positive reviews from macworld.co.uk, Makeuseof.com , Cultofmac.com etc., and we have kept it as a bonus, if you are having troubles with your iPhone eating too much memory and slowing down, just download this software and have a free trial. Alongside cleaning junk and unwanted files, the software allows you to free up massive amount of disk space. Step 1.Download the iPhone cleaner on computer. Connect your iOS device with a USB cable. Step 2.Hit "Quick Scan" button at the home interface to run a complete scan to know the total amount of space that can be freed. Step 3.Choose from a list of options including “Junk Files, Temporary Files” etc. And refresh your device with this best iOS cleaner. If you still need more space, you can also manage music/video space easily. With iPhone Data manager, you can back up iPhone music/video and delete them from iPhone to save space. Of course, you can restore backups anytime. 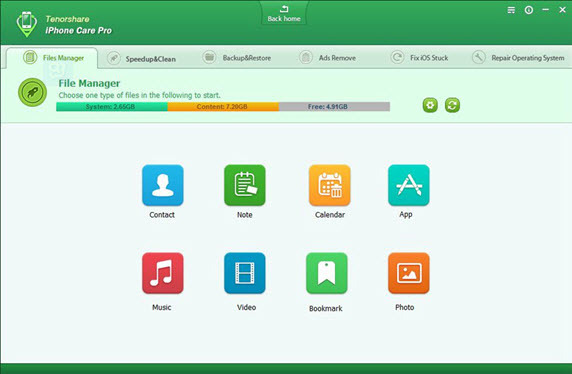 Sometimes our iPhone need more than just a regular cleanup, you might have heard about the apps that help you to optimize your smartphone and iFreeUp App is one such great app made for iOS, this iOS memory cleaner for iPhone diagnoses your device and removes unnecessary files briskly. Clean useless files created by iOS apps to free up available space. Clean hidden files to boost up iPhone. Though someone may say that no iOS iPhone cleaner can easily clear all junk that iPhone have, but still this app has gained a good reputation for its simple interface and ability to clear out residue and temporary files thus creating more space in your device. Deep scan of iPhone space and analysis of how much space can be saved. 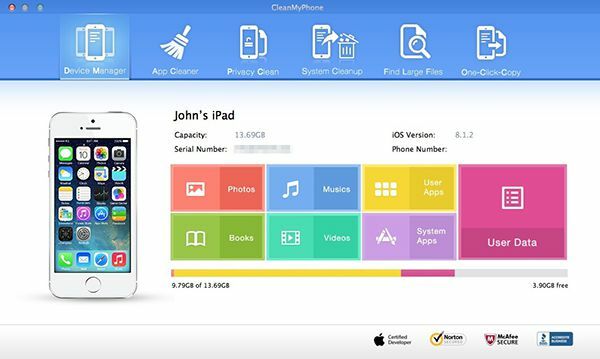 Find out and quickly clean large files from iPhone. You can call it an easy alternative to iTunes itself, the app now seamlessly allows you to clean data, ads, cache in browsers but also allows you to transfer music, photos, videos etc. The best feature about this software is that it allows you to block ads within your browser with just a click in settings. It is available for windows and mac both. Quickly clean photo cache, crash logs, cookies, iOS app cache, etc. It blocks and removes ads in apps from iPhone/iPad. This is a short, minimal and simplistic iOS cleaner for iPhone that allows you to free up memory on your iOS device with ease. All the cluster and deep rooted junk files can be cleared away within a grasp of a click. Not only cleans up disk memory but also fixes small errors on your iOS. Feature in 20+ data anyalyzing technologies to clear 30 types of junk files. Which iPhone Cleaner App Do You Prefer? Puedo Comprar Más Espacio de Almacenamiento para Mi iPhone? Good article, finally i choose iMyfone, as i try the trial version, it scan my iPhone and give a complete analysis. Also for its easy using interface. For my 15GB iPhone 5S, the ios memory cleaner should be a must-have tool. It’s nice to give us so many options. The comaprison table is Good! make everything clear.